Once you have set up your blog you will be presented with the basic blank site which you can now start adding content to. Use the links below to easily navigate this guide. The options below are available in both Posts and Pages. Posts will be added to your blog feed, whereas pages will be added as site content. 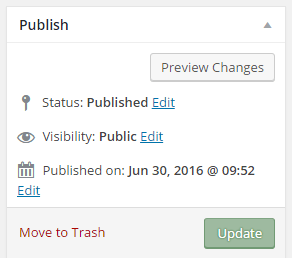 To create a post use the menu on the left hand side of the dashboard to select ‘Posts’. This will take you to a list of your current posts and will allow you to create a new one by selecting the ‘Add New’ button. Once you have created the post you can give it a title and begin to add content. This can include text, images, links and videos. There are two different editing options available, Visual and Text. Video gives you a formatted view of the post, in which you can change styles and fonts using the toolbar and also re-size and move images and videos easily. The text mode allows you the option of editing the content in HTML. The toolbar at the top of the editor gives you options similar to any normal text editor, although it does give you the option to add special features including Read More tags. You can add videos and images by either dragging and dropping it onto the editing window or by using the ‘Add Media’ button found above. This will open up the media gallery (this is also accessible from the media button in the side menu when not editing a post) from here you can upload media and also select from previously used videos and images. This same method can be used to add links to files including word documents and PDFs. Once you have inserted an image or video you can use live editing tools in the Visual editing window to re-size and move the inserted media. You can embed content from external sites, including youtube and vimeo, using the ‘Add Media’ window or by inserting the embed code using the text/HTML editor. To embed content from within the ‘Add Media’ window you need to select the ‘Insert Embed Code’ option from the left hand menu. From here you can paste in the embed code to add your content. There is a button within the top toolbar which allows you to add links to external content. You can either select this button to add a stand alone link, or by selecting the text you want to hyperlink and then using the add link button. Depending on the setup of your blogs theme a featured image of the post may appear on the homepage, the blog page or the post page. To add a features image use the ‘Set featured image’ option in the right hand sidebar. This will allow you to select a featured image from your media gallery or upload one. By assigning a category to your post you can improve the search ability and navigation of your site. Once you have created categories you can use them to create custom menus and featured post areas. To create a new category select the ‘+ Add New Category’ option from right sidebar and add a title for your category, you can then use the tick list to add the new post this category or an existing one. Once you have added your content to the post you can preview how it will appear by using the ‘Preview’ button in the top right sidebar. 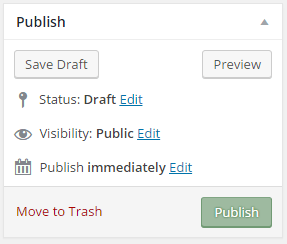 This sidebar gives you the option to Save and draft, preview a post, publish a post and edit the visibility and schedule the publishing of a post. Once you are happy with you post use the Publish button to make it public. Once a post is published you can make changes and make them live by using the ‘Update’ button, which will appear in the place on the Publish button.